The Tulsa County Sheriff’s Office expects to equip patrol deputies with body-worn cameras within the first quarter of 2018. The rollout of the pilot program, which includes body cameras and associated equipment provided by Axon, is pending approval of policies and procedures for use of the cameras. “What this does is gives us a better tool for accountability and transparency that I do believe needs to be in place as we serve our citizens,” Tulsa County Sheriff Vic Regalado said. The sheriff discussed the status of equipping his deputies with body cameras Friday during an announcement that the Cherokee Nation donated $8,000 to the Tulsa County Sheriff’s Office Foundation. The donation was earmarked for body cameras. 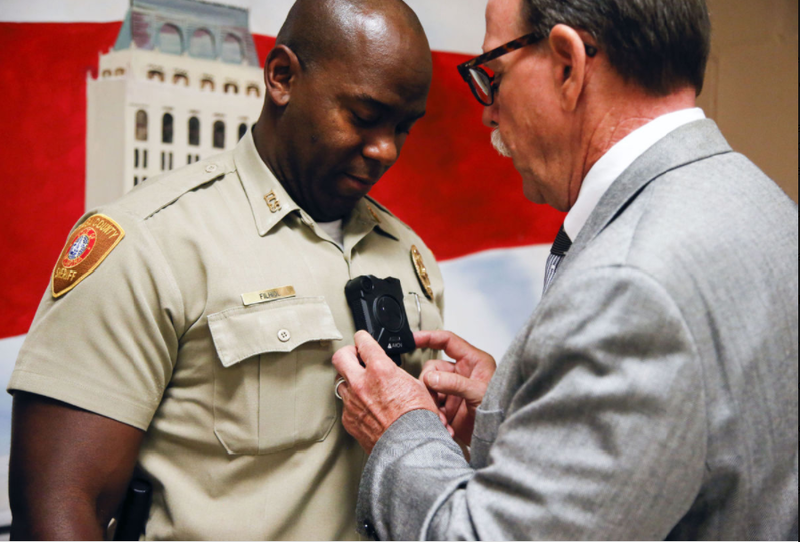 Axon, formerly known as TASER, provided 55 body-worn cameras — and the accompanying software, docking stations and digital storage — to the Sheriff’s Office. The goal is to have at least 80. The equipment and storage are free for a year, after which the department can decide to discontinue the affiliation or begin paying Axon for data storage, according to a previous story.In either case, the Sheriff’s Office keeps the cameras without charge. “Unfortunately, because of budget constraints, it’s difficult to put a system in place and sustain that going forward,” Regalado. Sheriff’s Office officials said the estimated cost for storage, after the program expires, will be about $960 per camera per year. After the yearlong deal expires, the Sheriff’s Office will have to request bids for continued storage of the videos, Regalado said. Cherokee Nation Tribal Councilor Buel Anglen, who presented the donation to the Sheriff’s Office and its foundation, said the Cherokee Nation made the contribution to help the Sheriff’s Office protect tribal citizens and non-citizens. Anglen’s district covers Tulsa County and Rogers County parts of the Cherokee Nation.